UPDATE: Confirmed that the campus will open on September 3. 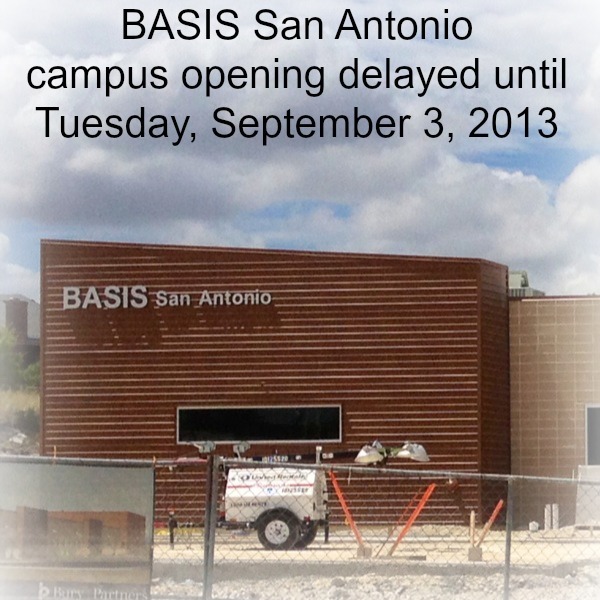 The opening of the BASIS San Antonio campus has been delayed by one week, until Tuesday, September 3, 2013, due to construction delays. From Monday, August 26 through Friday, August 30, BASIS is providing alternate educational activities for the students. UPDATE: “BASIS charter won’t open Monday as planned”, Maria Luisa Cesar, San Antonio Express-News, August 25, 2013; “Charter school start delayed by a week; parents notified by email Sunday”, Gary Cooper, KENS-5, August 25, 2013; “Schools Push Back Start Dates”, Robert Price, KABB-29, August 26, 2013; “What is plan B?”, Darlene Dorsey, WOAI-4, August 18, 2013. We are tremendously disappointed to let you know about a temporary change in our planned opening tomorrow. We are prepared, our teachers are ready and eager, but the building is not yet ready. Consequently, we will not be allowed to open our school until Tuesday, September 3rd. We are profoundly saddened by this turn of events, and apologize to each of you for this disruptive delay: we are very sorry. We realize only too well that we have disrupted your plans. Therefore, we are offering an optional tuition- free enrichment program. On Monday, it will be held at [location withheld] from 7AM to 1:30PM, the same hours as we would have been at school. All of our teachers will be there running structured activities for the children. If this helps mitigate the disruption to your day, please bring your children and we will all be gathered to receive them warmly. We will offer enrichment for the remainder of the week, regular school hours, including Early Bird and Late Bird for those who have registered. We will send details about the remainder of the week later this evening. If you are not registered, you can bring your registration packets and your child to [location withheld]. If your child will not participating in the enrichment program, please bring your registration to our temporary office at 9901 HWY 10, Suite 800 (corner Wurzbach and HWY 10). Thank you for your patience, continued support and trust in BASIS. Words cannot express our disappointment in bringing you this news. Here is an earlier post with a photo of the campus under construction. I must say that I think it is very inconsiderate to send an email to parents the day before school opening to state that school will not be opening. This would not be tolerated if it were NISD or any of the school districts. The response I have been hearing from most of the BASIS parents is that they do not mind a one week delay, because their kids are getting a full year of BASIS education. They are glad the school made the extra effort to try to open in 2013 rather than wait until 2014. I’m a Basis parent and am happy to say that today went off without a hitch. I just picked up my children and have to say that they are excited about learning new things and can’t wait to return tomorrow. Thank you Basis for keeping me informed each step of the way. Thank you to Mrs. O’neill (Head of School) for taking time out to call me personally and let me know that although the school building is not yet ready, Basis made accommodations for all the students to have enrichment activities all week. Thank you to all the Basis teachers that cut their summer short to make alternate plans for this week to accommodate all the students. Thank you to the Parent Booster executive board for keeping us all informed and letting us know that you all experienced first hand the hard work that all the teachers and staff did over the weekend to make sure that the students would have an enrichment program for this week. Although the building is not ready, Basis has done an excellent job in setting my expectations. Unlike NISD or any other school districts, I have to say that BASIS has been excellent updating us on a daily basis by means of emails, phone calls, facebook community message board, Booster communication, etc. I am not disappointed in their methods of communication because it has been constant and never left in the dark about what is actually going on. Yes, disappointed that the school didn’t open its doors today, but they went out of their way to provide our children with an enrichment program until opening day. They are considerate and a blessing for us that our children’s safety came first not their ego or their fear of dealing with irate parents. They have been wonderful. Thank you BASIS for all that you do!!! As a BASIS parent, I believe the benefit my child will receive from the curriculum and academic rigor over the next six years far outweighs the inconvenience of a delayed opening. I’m thinking long term. We shall see what the naysayers are saying in a few years when our children are learning at a ridiculously accelerated pace. I still believe in BASIS. Things like this happen. The contractors said they would be done and they weren’t… So be it. The enrichment activities have been received well and the teachers were thrilled to be able to get to know the children this week. I”m a BASIS parent. Yes, the delay was disappointing but when you what the school will be giving our children throughout the year is amazing. One week is not a big deal when our children will be given an amazing education with fantastic teachers. The children in my carpool love attending all of the enrichment activities. They’ve met their teachers and fellow students in a low stress environment. BASIS parents and kids aren’t “run of the mill”! We jump through hoops to get our kids the best education our city has to offer. We can handle a week delay and a bit of inconvenience for a long term tremendous opportunity for our children. Those that decided not to give it a “go”, of course our taking a deep breath as a reaction to the media, thinking they were smart not to go this route. We have known from the beginning that BASIS is NOT for everyone, and that’s exactly why we put our kids there. We don’t want our kids to be like “everyone else”!! Thank you BASIS teachers and admin for the outpouring of effort to make this an exceptional experience! We are ready for an outstanding year! !